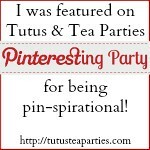 I love DIY party accessories. It's great to see what each child creates. For New Year's Eve you can't go wrong with some fun masks. 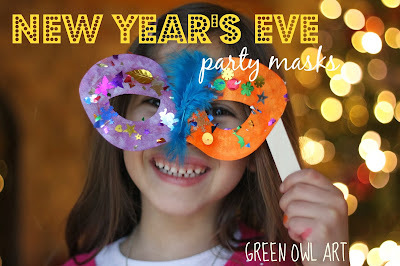 I grabbed these basic eye mask cut-outs for our New Year's Eve party (you could also cut a simple eyes mask from card stock or a paper plate) and I will provide the kids with dot paints, glue sticks, sequins, feathers and confetti to decorate. They can add a simple craft stick to the back with masking tape to hold over their eyes. There is so much that can be done with these. It would be fun to challenge the grown-ups as well! This one is just dot paints with confetti on top. So colorful! 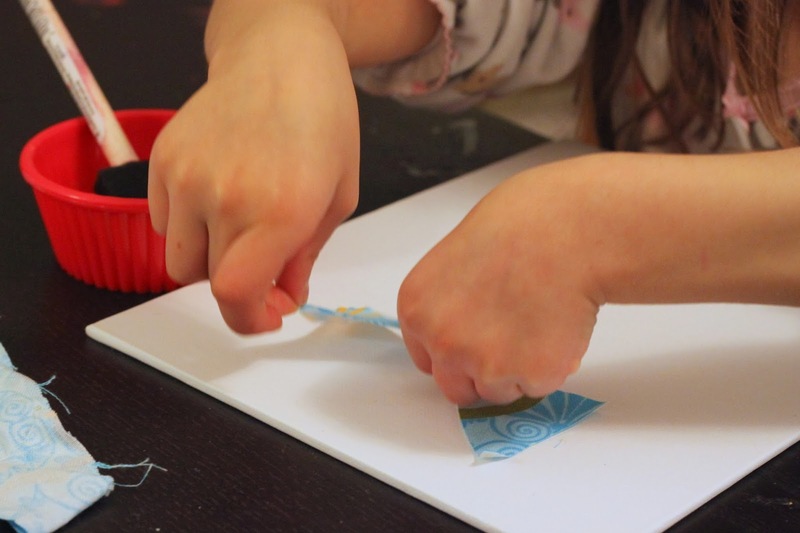 You could use the craft stick or even an elastic band. I might have to pull these back out for Mardi Gras. Happy New Year! See you in 2014!! Hello Friends! Can you believe how fast the holidays are flying by?! I hope you all had a wonderful holiday season. We spent two great weeks visiting all of our family and are now preparing for our kid-friendly New Year's Eve party with some great friends. 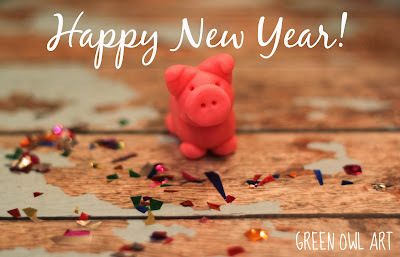 I love adopting new traditions, so when I first read about the lucky New Year marzipan pig on Red Ted Art I knew I had to add this to our kids craft table this year. How could you resist this adorable pile of sugar?? In Germany it is a sign of good luck when someone gives you a marzipan pig. 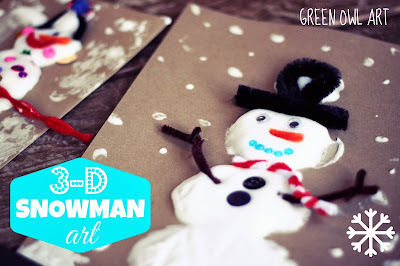 I thought it would be fun for the kids to make these tomorrow for their friends and family. 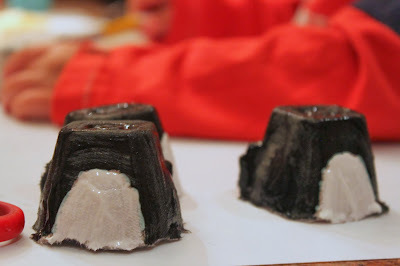 I did have to go with fondant instead of marzipan (hope that won't effect our luck!) Check out the tutorial by Red Ted Art for all the details. Sorry I didn't get any more photos of the actual process. It was a bit sticky to work with so I decided to keep my camera (which ironically is covered in paint and glue) out of this craft. It is pretty simple though, just like working with sticky clay. I bought white fondant and colored it by kneading in pink food color. I thought these mini muffin cups would be the perfect size to take these little piggies home. Wishing you much love and luck this New Year! Today Em has woke up early and headed into our art room for some major gift crafting time. She has a long list of ideas and has that creative look in her eyes that makes a mama proud! I think we might just stay in the art room all day long. Since we are in homemade gift mode at the moment I thought I would share this favorite of ours that is perfect for a friend, cousin or anyone that loves to get fancy! 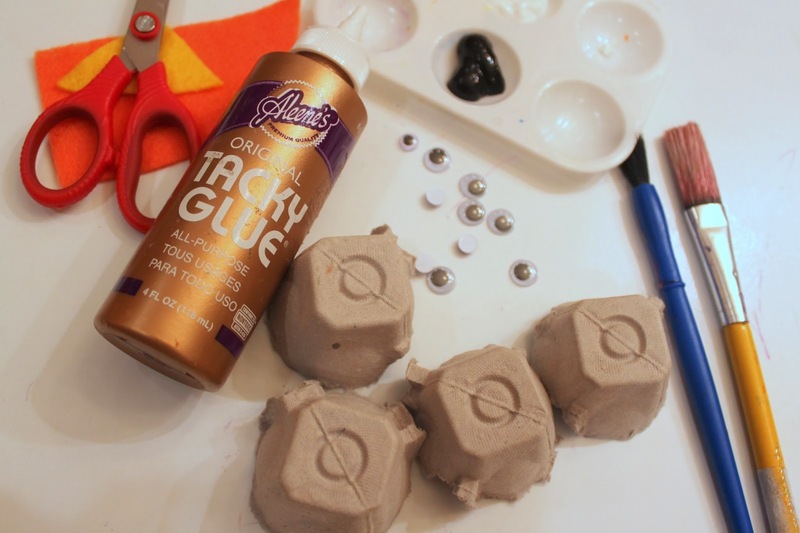 Best of all you don't need much to make this great gift--a few large wooden beads, twine, acrylic paint (we like shimmery colors,) a paint brush and a paper cup. 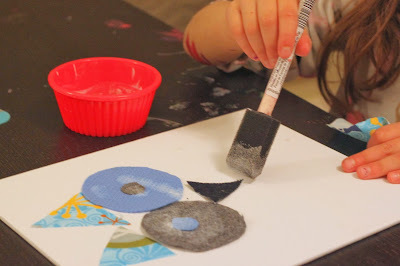 The paper cup is helpful to paint the wooden beads all at once without them rolling all over the place. Once they are covered pretty well we laid them on a piece of cardboard to dry and touched up a few spots with paint. A little twine brought our very cool bubble necklace to life! I think that's pretty good for a DIY gift, don't you? 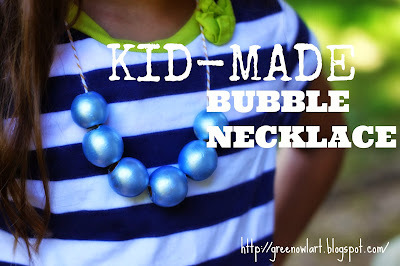 We have made a few of these now and it is a lot of fun to experiment with new paint colors. A favorite of mine was the black and white (aka zebra necklace) that Em made for a friend. We also tried some florescent colors that were a big hit! 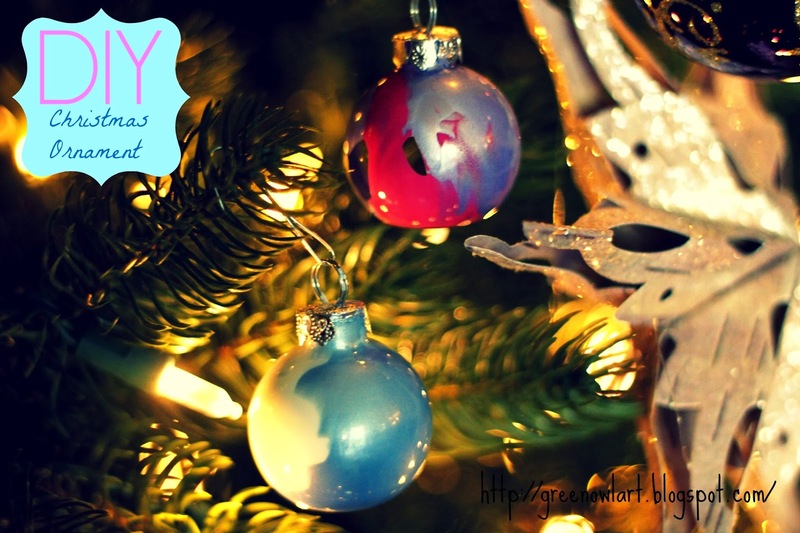 I shared this and many more homemade gift ideas over at Kiwi Crate. We made these penguins last winter and I just pulled out the goods to make them again this morning. I adore penguins and I think I have passed on this love to the kiddos. I also love a good recycled craft, so this one is a keeper! I broke apart the egg carton cups for the kids and grabbed some tacky glue, felt, scissors, googly eyes and black and white paint. 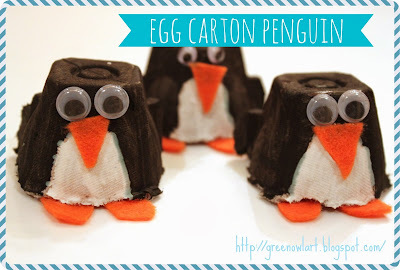 This morning I think we may even make a few purple penguins. The kids painted the entire egg cups black except for the "belly" which was of course white. 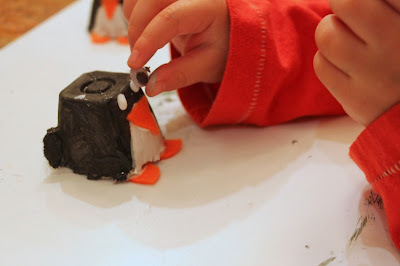 For our little penguin feet we used felt. 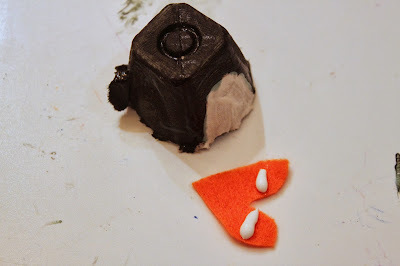 Cutting the felt into a small heart shape worked perfect and a little tacky glue held it on to our egg cups. 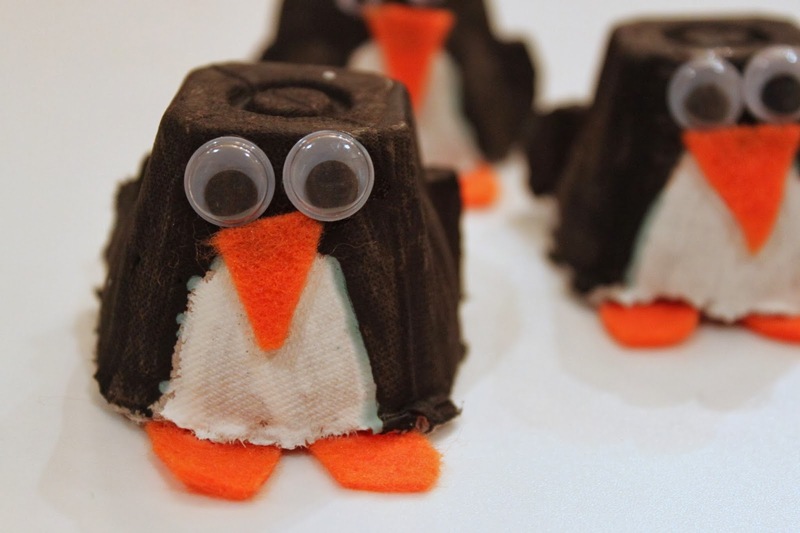 A felt triangle and googly eyes finished off our little guy and the kids discovered they could use these as finger puppets! How fun! How cute are these little penguins? I just love how they turned out. I think I may include this craft at our family kids Christmas table. 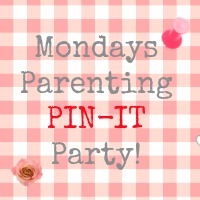 It would be fun to add some other fun accessories to the mix and see what the kids could come up with. A penguin with some fun yarn hair perhaps?? I shared this over at Kiwi Crate. Join me there for more winter fun crafts. We made some gingerbread playdough last week for our favorite kindergarten teacher and had to keep a batch for ourselves. 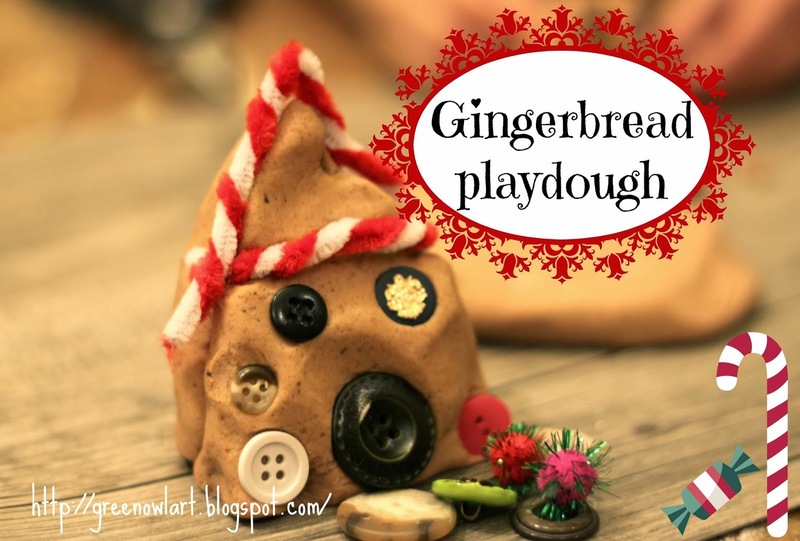 When I put it out for the kids I gave them a few gingerbread men cookie cutters and little trinkets to decorate their dough cookies with. To my surprise they had much bigger plans for their new heavenly smelling dough-- gingerbread houses, of course! 1. Add all ingredients to a large mixing bowl in order as listed. As soon as you add the boiling water begin mixing well. 2. Dump dough onto a flat surface and add remaining flour while kneading. 3. Build a gingerbread house! **This recipe varies a bit, if your dough is too dry add more hot water, too wet add more flour. Our first snow arrived today. Nothing like it. 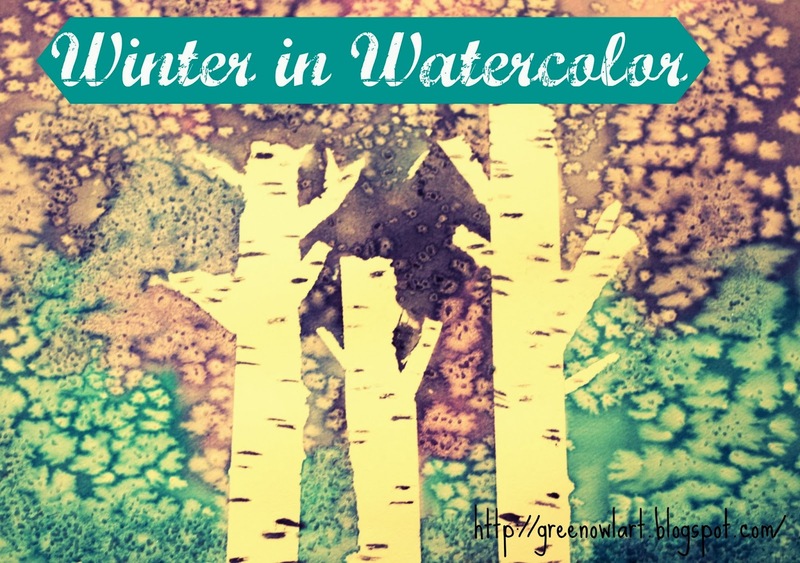 We were in a happy winter mood and decided it was the perfect afternoon for some winter scene paintings. I am a big fan of watercolors for my children and myself. There are so many different ways to use and adapt them to every age. 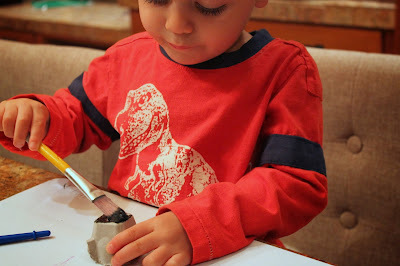 There is not much I would rather be doing then sitting with my kids and creating a watercolor painting together. It just makes me happy! For this winter scene project we used a pan set, but we are big fans of liquid watercolors as well. 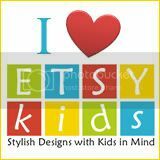 They are easy for little ones to use and you can also use it for things like shaving cream prints and to color play dough! Talk about versatile. This project has been done in so many different ways and I wish I could find my first inspiration for it, but we've been painting these for several years now and it never gets old. Once the masking tape trees were in place the kids started to paint the background winter sky. I asked them to use only three colors for this project and focus on blending the colors. While the painting was still wet we sprinkled a little bit of sea salt on top. This is to create a snowy look. The salt absorbs the watercolor and looks like snowflakes falling. It's instantly beautiful. G got a little carried away with the salt. I was just happy how engaged he was in this. I usually lose the little one after step two. Finally the tape comes off to reveal our beautiful birch trees. I think I forgot to mention to encourage tearing of the tape to create rough edges. It makes a big difference. Using a dry brush we added lines to the trees and let our painting dry. Once dry most of the salt falls off and leaves behind our wonderful snowflakes. What a great way to spend our first snow day. 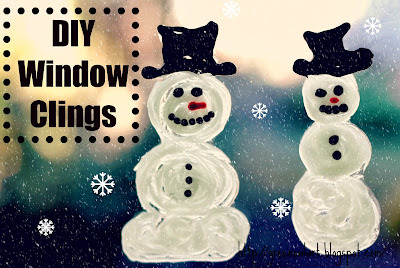 Happy winter, friends! When you think kid-made ornament you probably think of salt dough stars and hand-print reindeer, but this year we wanted to step out of that box and try something new and "fancy" as Em says. Yes, I am in trouble with that one! I came across these glass balls and thought we could definitely use these for our traditional ornament making night. I added a drop or two of all surface arcylic paint to each ornament and placed the top back on. Shake. shake, shake!! This took some good shaking to get the paint to splatter around. I think I might water down the paints next time we do this to give it more movement. We dried these over night with the top off. Look how pretty they turned out! The perfect fit for our "fancy" tree! We just got back from a beautiful Thanksgiving week with family and now I am feeling ready to conquer Christmas! Our tree is up, lights are on and homemade gifts in the works. You all know I love a good homemade gift for so many reasons, but mostly because it gets my kids being creative and resourceful. Buy less--create more! 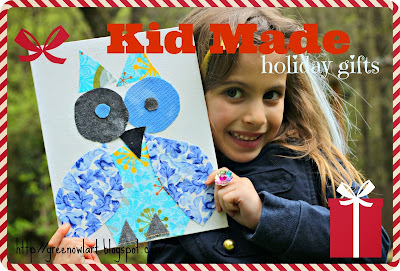 For this simple collage we used fabric scraps, mod podge, a canvas, scissors and foam brush. Looking at this photo now it looks a little dangerous, but I assure you I was close by watching like a hawk. 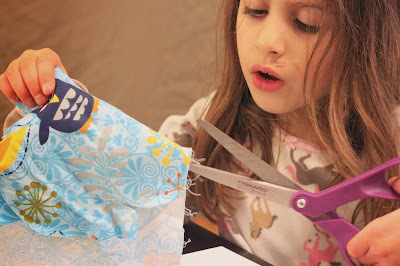 She just loves the grown-up tools and I don't blame her, ever try cutting fabric with kids scissors?? Em cut random pieces of her favorite fabric scraps and then arranged them into a collage on the canvas. 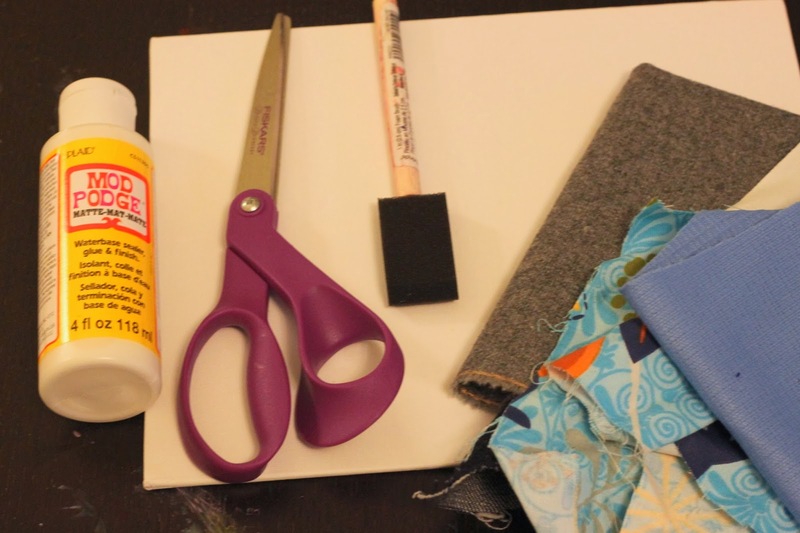 Once she settled on a design she used mod podge to hold the fabric to the canvas. A good coat over the entire canvas at the end helps to give it a nice smooth look. 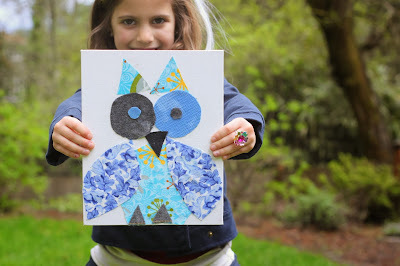 I love this project for just about any age because it can be an image or just a beautiful abstract work of art. This is going to be a great gift to custom for grandparents. I shared this over at Kiwi Crate. Head there for the full tutorial!